I was thrilled when I heard that my former professor Craig Hood was willing and able to participate in TT4! Craig's work is amazing - examining the role of the human figure as a narrative image in landscapes. 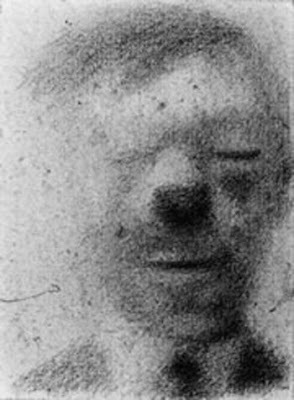 "His graphite drawings are a blur from a distance, like a foggy dream or the memory of a black and white photograph." 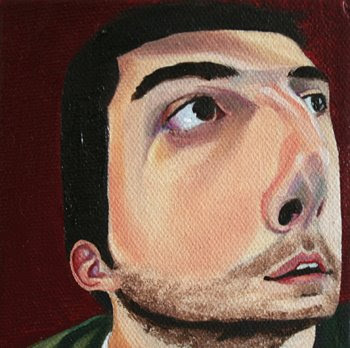 Craig dropped off some truly tiny portraits - they are the tiniest of the teeny tiny - some measuring 1"x1" square! Craig Hood lives and works in Portsmouth, NH. He has taught painting and drawing at The University of New Hampshire since 1981. He has a national exhibition record and has won a Ford Foundation Grant, been a finalist for the Rome Prize in Painting (1987), and was nominated for a Louis Comfort-Tiffany Award (1999). His landscape paintings have been exhibited in many venues from Portland, ME to New York City and Naples, FL. In recent years he has focused more exclusively on the figure-in-landscape images he has made since the early 1990s. 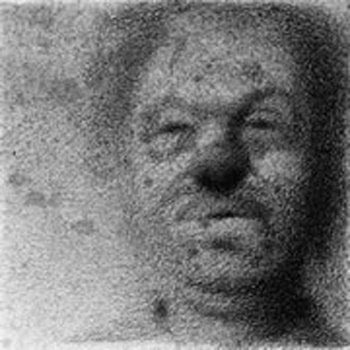 In Sept.-Oct. of 2006 one of his works in this genre was included in an important exhibition at the Ogunquit Museum of American Art, The Figure in American Painting and Drawing, 1985-2005. You can preview these and other works from the show here. 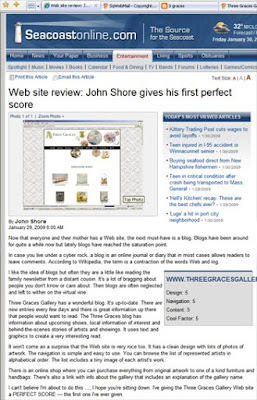 The review is especially satisfying because I've been working very hard to teach myself web skills, endless tutorials and exhaustive google searches - I actually began designing my website three years ago in Microsoft Word, cutting and pasting (it looked awful!) ... so this review is a HUGE compliment. Read the review here. The Teeny Tiny Art Show #4 is less than a week away! Small packages containing tiny art are coming in from all over the country - I just received some new work from Bailey Saliwanchik, her recent portraits are a refreshing departure from her "playful portrayals of traditional female archtypes reflecting on themes of spirituality, sexuality, beauty and a gentle relationship with nature". "Bailey Saliwanchik hails from the deep woods, swampy fields and blue skies of Maine, emerging with a belief in plant magic and the enchanted female. 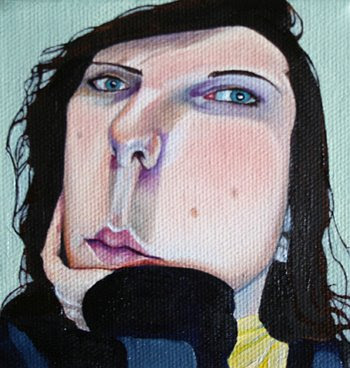 Her subjects are borne from a process of intuitive visual construction and combined interests in contemporary illustration, fashion illustration, classic figurative painting, ancient ideologies, goddess worship and fantastical female characters : gypsies, princesses, witches, mermaids, cowgirls, nuns, dancers queens and mediums. She loves big hair, books by Tom Robbins, ambiguous symbolism, gin, curls, and pumpkin muffins. She is currently based in Brooklyn, NY." Rapunzel, Rapunzel, let down your ... noodles!? ... a tale of knightly virtues, honor and courtly love. You can see the other drawings from this series by Nicole Maloof, along with other works from the upcoming Teeny Tiny Art Show #4 here! Nicole Maloof was born in 1983 in Seoul, South Korea. She received her BFA with a concentration in Painting and her BA with a concentration in Chemistry from Boston University in 2006. She currently resides in Boston, MA. 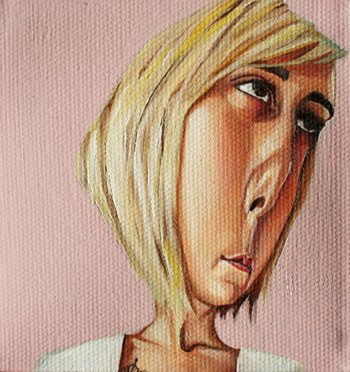 *Nicole has participated in all four tiny art shows and she has a solo show at Three Graces scheduled for June 2009. 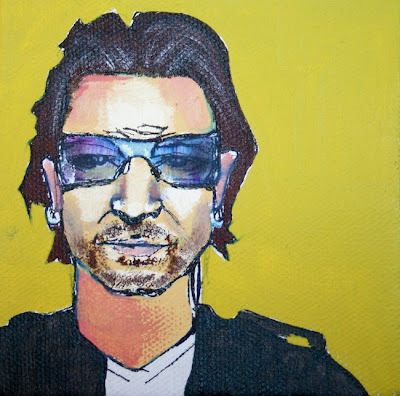 ...before I go, I thought it would be appropriate to share another teeny tiny preview: Jodie Baehre (who exhibited a fabulous series of "saints" in the TT3 in September) has been working on a series of portraits of figures from pop-culture! Above is of course, our President Elect Obama and below - Bono! 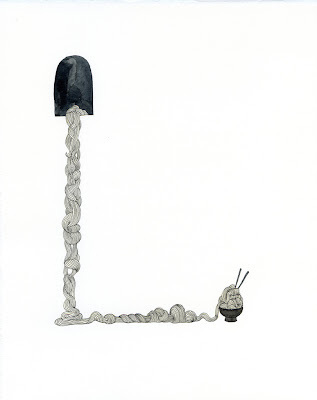 Kelly received her BFA in Fine arts from the Laguna College of Art and Design. In addition to painting, printmaking and sculpture, Kelly has created a comic called “Patches”. She currently works and lives in Escondido, California. 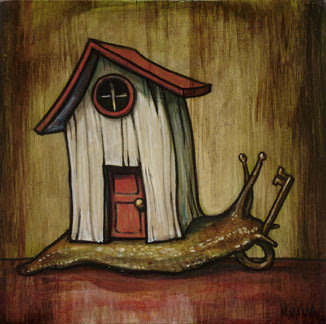 You can preview Kelly's other works in this tiny series along with other works from the show here. 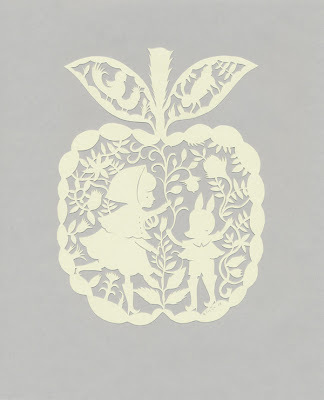 Another teeny tiny teaser - here are two images of new works for the Teeny Tiny Art Show #4 by Robin Beaty. 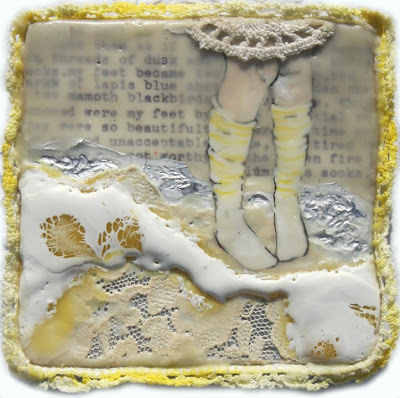 Robin concentrates primarily on the ancient wax base medium of encaustic paint, a molten beeswax mixed with resin and dry pigments, which she incorporates mixed media, vintage materials, textiles, metals and found objects. 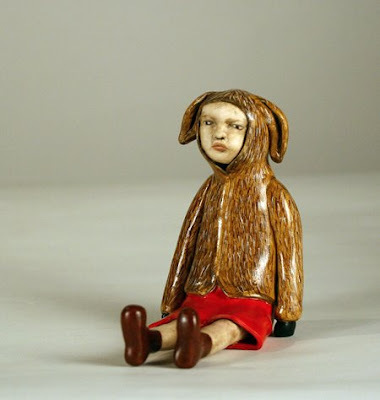 Her work has been described as a "compelling intersection between painting, sculpture and installation" and "deliciously collectable". 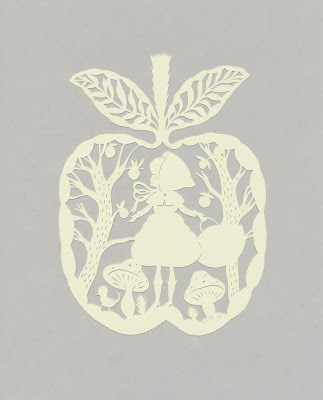 It's time for another teeny tiny preview of what's to come in the fast approaching Teeny Tiny Art Show #4! 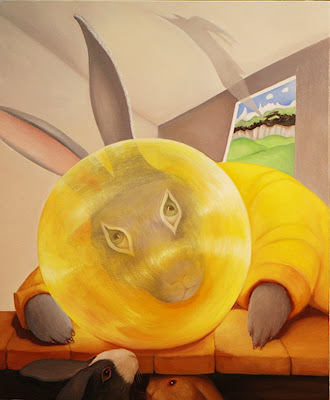 I have admired the work of Cassandra + Ernie Velasco, aka Doubleparlour, for awhile now...so I was overjoyed when they both agreed to participate in TT4. Above is "Mattie", one of six polymer clay sculptures that they will be sending. She is truly tiny - measuring 2.5 x 4 inches! 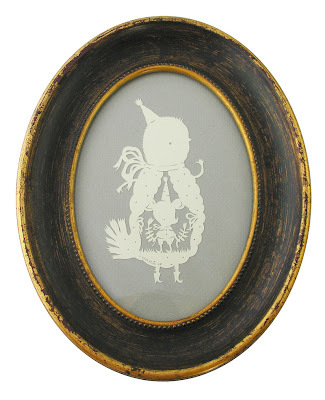 Doubleparlour, born in 2007, is a creative collaboration between Ernesto and Cassandra Velasco. 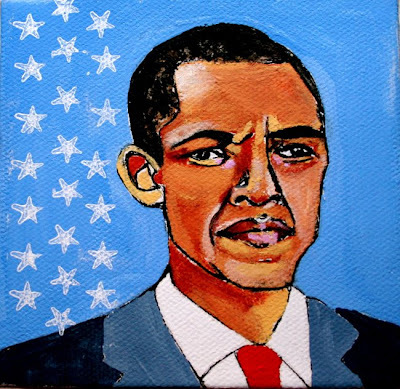 Both are artists who like to explore a variety of subject matters with different mediums. Some works are done as a joint effort and others are solo works. They like to mix it up in a variety of mediums to create sculptures, paintings, drawings and prints. 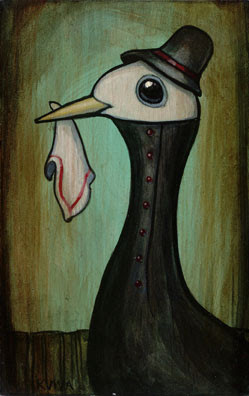 Three Graces will also have a bunch of their prints available during the Teeny Tiny Art Show in February. *All works from the show will be available in the gallery and in our online shop! As I was leaving the gym last night I picked up a copy of this week's Wire. I was delighted to read the review of Fleur's show written by Chloe Johnson. read all about it. Thanks Chloe! ...And while you're on the site check out the upcoming RPM challenge to music makers! You can also go directly to the RPM website. "This is the challenge: record an album in 28 days, just because you can." 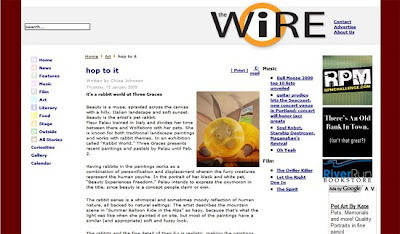 "Rabbit World dreamy and absorbing..."
I was so pleased to pick up this week's Spotlight and see a review of "Fleur Palau:Rabbit World" by Ann Bryant! 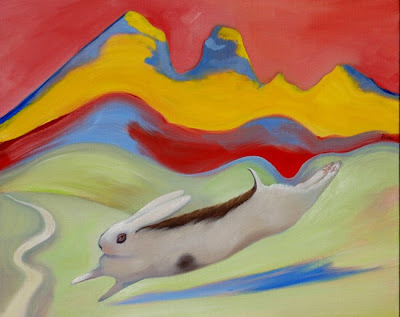 "This "Rabbit World" is not just a collection of rabbits, but rather a place made more real by echoed landscapes. The window in "The Investigation" looks out on the same field and mountains where "The Secret" is told. A consistency of colors shows that even when landscapes are simplified, that we are looking at the same flora and fauna." You can read the review in its entirety here. Thanks Ann! Stay tuned for more teeny tiny previews. Cheers! 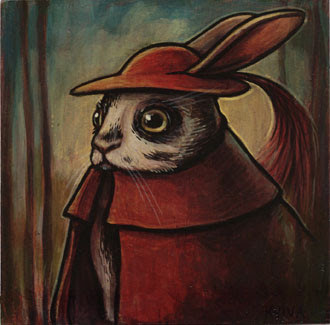 Last night was the opening reception of "Rabbit World" recent paintings by Fleur Palau. 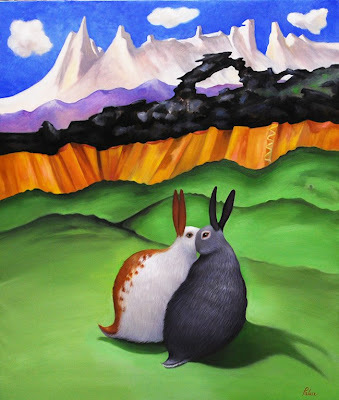 Her whimsical theme of rabbits in Italian landscape verges on the surreal. Rich color and tone predominate, the compositions take on a dynamic tension as Fleur creates a world that evokes elements of the human condition. States of being and emotion are explored in a world that is real and unreal at the same time. It is an examination of our interior life set off against the antique world of cypress trees, empty houses and ambiguous paths of no return. 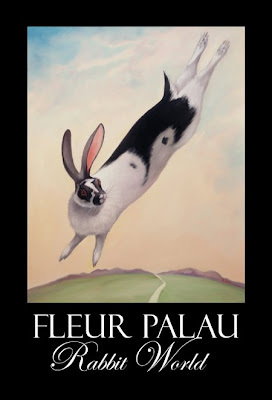 Fleur Palau is an American artist, trained in both New York and Florence,Italy. Fleur has lived and worked in Italy for over 20 years where she maintains a home and working studio. 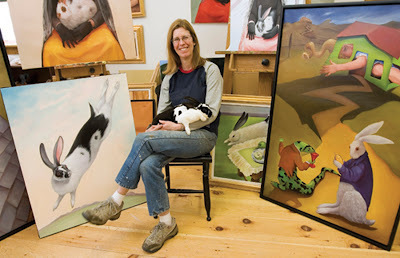 She is currently living in New Hampshire, and is known for her work in landscape painting, rabbit theme, and stone carving. 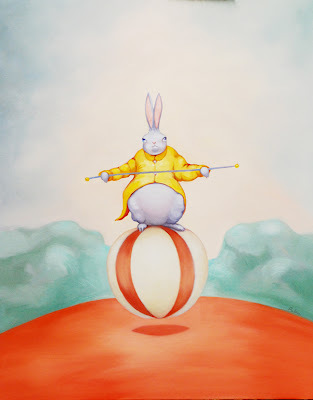 "Rabbit World" is on view thru February 2nd. 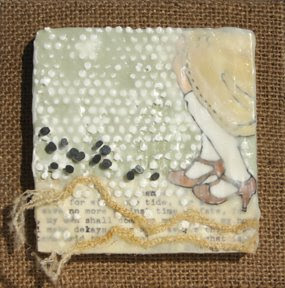 I will also be posting all of the images from the show to our online shop later today!